Have you ever dreamed of wielding a light saber? Of dueling at dawn? Of rattling sabres aboard a pirate ship? Come to Cutting Edge Fencing for a taste of the Olympic sport of Fencing and an experience like one you’ve only dreamed of! An Introductory Membership is the way to get started. You’ll be able to attend up to 2 of our practice sessions a week for 1 month: see the schedule for the appropriate times for your age group. 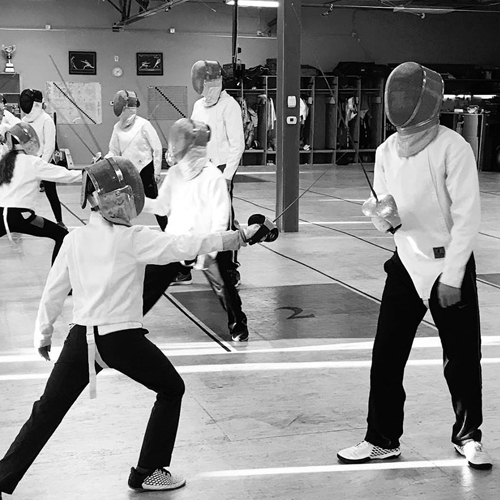 During that first month, we’ll teach you to the basics of fencing, help you begin your “journey with the sword,” and introduce you to the community of fencers at Cutting Edge Fencing. At the completion of your first month, you’ll be ready to join with a Basic Membership which will be prorated according to the number of days left in that month. What is included in the Introductory Package? Add a second (or third, or more!) family member for $30 off their mebership! If you’re looking to take advantage of the family option, you’ll need to register for the subsequent members, but don’t actually pay immediately. Send us an email, we’ll verify the family members, and apply the discounted rate to the additional memberships. Then you can either log in and pay through the website or pay when you arrive at CEFC for your first class! Wear sweatpants, t-shirt, athletic shoes and bring a water bottle (or we have water for sale). All other equipment for the beginner classes is provided. At the end of your first month, you’ll need to purchase your own set of Fencing Knickers to wear in order to continue participating in practice sessions. Is there anything I can do to prepare ahead of time? Fencing is a sport, so you will be physically active! Make sure you are well-hydrated and nourished before you come in, but also give any meal you’ve eaten time to digest (at least one hour before practice). If you don’t have time for a meal, have a snack (protein bar, a piece of fruit, low-fat yogurt, or something similar). If you want to see what fencing is like ahead of time, check out our page with links to YouTube videos of Olympic-level fencers!